So another off-the-wall post here; how would you expect anything other? Another of my little projects this winter was to learn to play the Native American Indian Flute. I thought it might be nice having an instrument I could backpack and hike with during the summer, and I was also concerned about having a guitar in the cabin this winter, with the crazy low temperatures not being friendly to a delicate and expensive guitar (I ended up bringing my acoustic guitar, a Martin J-18, out to the cabin with me anyway – more on that later). I bought the flute in late January, a flute handmade out of walnut, in the key of E. It’s awesome. I’ve been playing it nearly every day, often for hours at a time. Playing a wind instrument is SO different to playing guitar .. I never pay attention to my breathing when playing guitar, and yet it’s almost the ONLY thing to give attention to on a wind instrument – learning the difference between ‘blowing’ and ‘breathing’ makes the world of difference to tone and depth. Lately I’ve found playing a few notes and riffs is a nice way to say ‘thanks’ to the mountains after I’ve done some photography .. so I usually get to my spot, pick out some compositions I want, play the flute while I wait for the light to really glow, then when I’m done, I play a few simple tunes to thank the landscape. It’s a treat for me to hear the flute amidst such scenery. 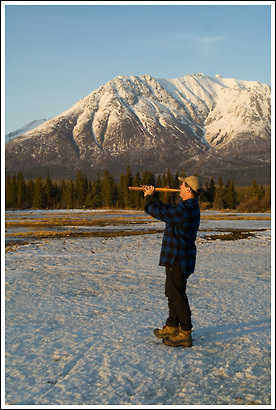 This entry was posted in Adventures, Alaska, Backpacking and Hiking, Landscapes, Music, People, Travel, Winter, Wrangell - St. Elias National Park on April 23, 2008 by Carl D.
That is cool Carl, I will have to hear you play someday. I will never forget an early morning in Monument Valley. I had camped near the entrance and arrived to the rim before sunrise; it was just me and a Native American gentlemen who played an amazing flute during a wonderful sunrise. It was magical, I will never forget it. It was hard to photograph, I just wanted to sit there and enjoy the amazing show. I never got a chance to talk to him, I at least wanted to thank him for the special moment, I supposed it went without saying. Didn’t know you played guitar – nice! I’ve taught myself about a dozen chords maybe 20 years ago LOL. I like the Flute idea a lot. I just might have to take that up myself. Would be a nice way to take a break from photography and have a creative change of pace. Your mother wants to know if thats really a native indian flute or a very long bong? Wow, that must have been awesome down at Monument Valley – those kinds of experiences are such a treat, I think. I know what you’re saying about not getting to talk to the guy, but I think in those situations, it’s really a good thing if we can express our appreciation for someone bringing their art into the world. Isn’t it great to see someone doing what that man was doing because it means a lot to him, and for no other reason than that? I think it’s very cool, I’m envious of your experience already. Awesome! Thanks for coming by. Now I’ve got a little more internet time I’ll check out your site a little closer .. a brief look earlier was great. You have some really neat stuff there. Mum’s showing her true colors, no doubt. Of course it’s a flute. Made by John Stillwell. Here’s his website. I don’t even own a bong. Yeah, maybe I’ll try to record something on the computer and post it here sometime. That’d be cool. I’ll have to do a bit more practice though, yet. 🙂 And don’t encourage my father’s errant commentary. Keep on plugging away with the flute, Carl. There’s nothing like playing native flute in wild places. In doing so, I feel more connected to the Natives who used to roam these lands. I hope you’re doing well, man! That looks like an absolutely beautiful setting to play the flute. I’m not very musical myself but I too am learning the Native American flute. This past year I had an experience similar to Ron’s at Monument Valley. I was there to photograph the west Mitten’s shadow being cast onto the east Mitten, but it looked like the sun wasn’t going to make an appearance due to low clouds on the horizon. Just before sunset it popped out and illuminated the Mittens; at the same time two Navajo men began to play, one beating a drum and the other playing a flute. I’ve been to the valley many times but it was easily the best experience I’ve had there and I’ll cherish it forever. Doing great bro, how’s yourself? Maybe I need to edit that typo – thanks for picking it up – the keyboard hasn’t yet been made that can adequately keep up with my typing. I agree with playing the native flute in these kinds of places – it’s definitely a connection. Very cool. Thanks for stopping in and the comment, I appreciate it. The Native American flute is so cool, isn’t it. And for someone without a musical background, I think it’s a great instrument to pick up. That experience you describe at the Mittens sounds awesome, what a treat. Thanks for sharing that, it’s great to hear about.